Hey i've got a few paintings in an art show! they're small and on paper, and the show is Noise Pop -related and it's called Sights of Sounds. i don't normally have time to make art unless there's a record cover due so i was glad to get the prod from former NC resident, photographer Andrew Paynter who's curating the show. 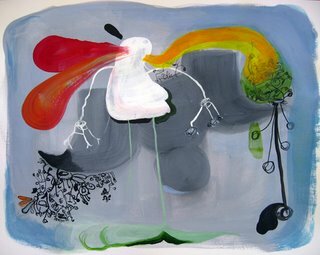 It's taking place at a gallery / store called the Park Life Store and some other folks with art in there are Clare Rojas, Nick Zinner of the Yeah Yeah Yeahs, and Tim Harrington of Les Savy Fav, among others. So if you're in SF in the next couple weeks check it out! the opening reception is Thursday, March 1st and the show runs through the 21st. Margaret and I finished up our west coast Portastatic swing last night in Los Angeles at the lovely art deco palace the El Rey Theater -- i think it's been gussied up since Superchunk last played there. Nice crowd, Camera Obscura was great and i've got their songs running thorugh my head as usual today. Annie Hayden brought her magic to a couple songs which was great, and Lee from Camera Obscura tore it up on the cabasa (sp?) in fine style. 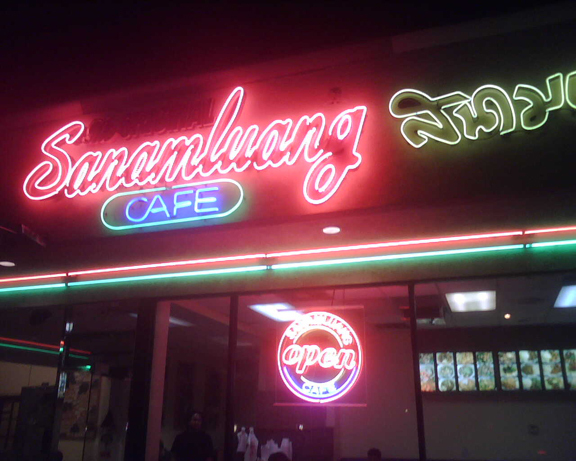 After the show hit the Sanamluang Cafe for some great Thai noodles, thanks to Marc for the recommendation. The night before in SF was an even better show on our end i think, prodded on by a couple of raving lunatics (in a good way) in the front row, who also joined us onstage for some percussion action. thanks to Mogs for rocking the violin, CO for the tour and to Kerry and Molly for minding the details so kindly. no celebs at the show last night that i know of, but i saw Terry Richardson at breakfast and Sam Cassell in the airport. the rainy town of Portland's show at the Wonder Ballroom was the best of the tour on the Portastatic side anyway, crowd was still filing in when we started but were quiet and appreciative the whole set. nice-sounding reverb in the room. had a raging late night party at some friends' house after the show with the Scots in attendance. Dave from Norfolk & Western did a terrible Jimi Hendrix impersonation and lampooned Bono. i woke up groggy and feeling like i had somehow lost an argument in which my position was that nobody makes worse records than Sting. but i did win the argument that if you were making The River into one album you would not take off "Sherry Darling" first. last night in Seattle was fun, the first Portastatic show ever in Vanouver was Ok, kind of a battle with Chatty Cathy and her 400 yammering friends, but still some good times, including a debut of a cover by Jim Wilbur's favorite band Prefab Sprout that we learned before soundcheck (always wanted to cover it, never took the time to dumb down the chord changes so i could play it....). 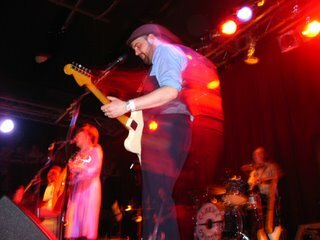 Camera Obscura killed 'em at Neumo's last night (pictured), it's really just hit after hit when you see them. 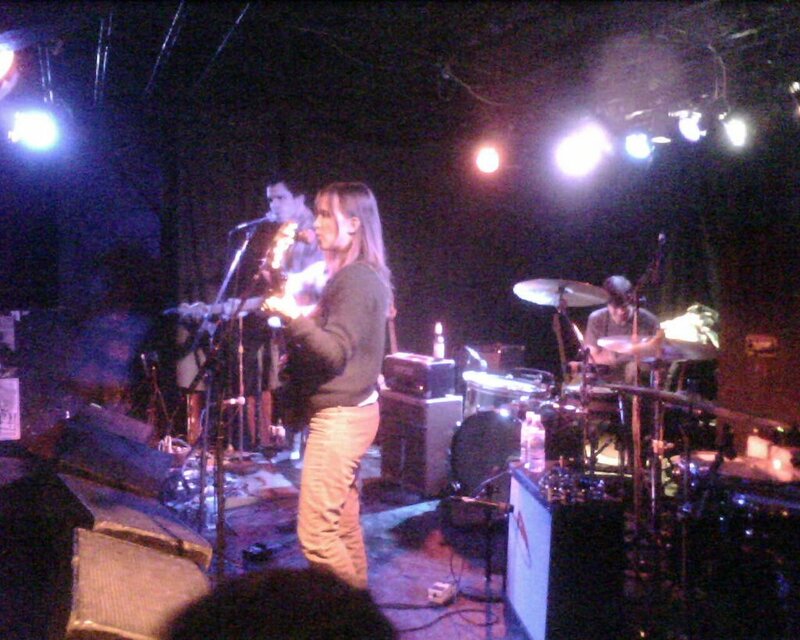 it was 10 below in Minneapolis Saturday night when we played at the Entry, but the place was packed with excitable people ready for rock and roll music. Dirty Projectors (pictured) were the first band, i had no idea what to expect and by the time they were done i was kind of like "ok we can all go home now because nothing is going to top that!" -- it was like a crazy amalgam of afrobeat, highlife, spazzy punky moments and beautiful unison singing from Amber and Angel. seriously, awesome, and to top it off they did the best Black Flag covers i've heard -- yes covers plural -- they did Police Story and Rise Above and supposedly have recorded all of the Damaged album (except TV Party) and it will be released....i for one can not wait. then Grizzly Bear played, really cool to see how they replicate the records in the live realm, they sounded great. first off playing on the excellent KEXP at 1 pm PCT -- 4 Eastern....listen in! as the plane was landing today coming into Minneapolis for our show tonight at the 7th St Entry, the pilot said "the temperature on the ground is One Degree," that was pretty funny. when you go outside and it's One at first it just seems cold like "oh this is pretty cold but no big deal" but pretty soon you can't move your face and it feels like you're barefoot and wearing a tank top at the North Pole (pre-Global Warming North Pole). 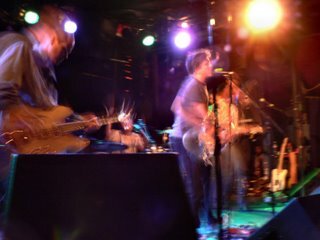 i think the last time i was at the Entry Superchunk was playing with Pegboy -- good times. anyway, looking forward to seeing Grizzly Bear tonight and don't know a thing about the Dirty Projectors except they have a cool name. "For real? He's gay for real? Nowadays it's proven that people can live double lives. I watch a lot of TV, so I see a lot of sick perverted stuff about married men running around with gay guys and all types of foolishness." "As long as you don't bring your gayness on me I'm fine," Randolph said. "As far as business-wise, I'm sure I could play with him. But I think it would create a little awkwardness in the locker room." how does one "bring your gayness on" someone else? King Kaufman has a good column on the subject over at Salon. speaking of embarrassing, last week the Stanley Cup Champion Carolina Hurricanes paid a visit to the White House, wherein we learned that Rod Brind'Amour waited in line for four hours in order to vote for freaking Bush. ugh. reminds me of the always-uninteresting Michael Jordan's line about "Republicans buy sneakers too" as to why he didn't campaign for Harvey Gantt when he ran against insane racist homophobe Jesse Helms. do these guys live in the world? keeping it short and sweet as the openers, and then yo la destroyed as usual, finishing up the last encore with a lovely piece of music from the score for the movie Junebug called "Green Arrow". 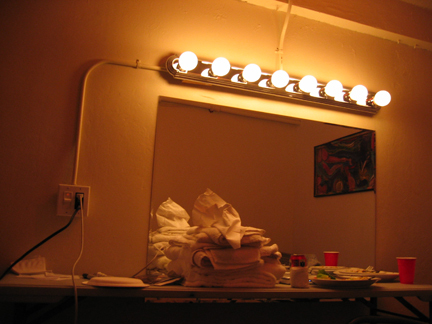 thanks to kevin sargent for the photo -- he's got a blog over HERE . Yo La Tengo hits town tonight for a pair of shows at the Cats Cradle, and Portastatic will be opening tonight, with the Rosebuds taking over tomorrow night.